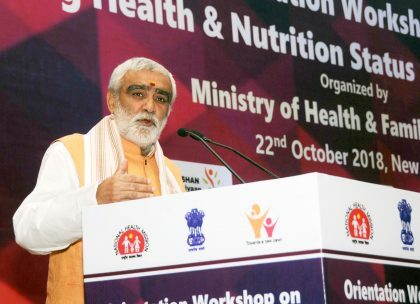 New Delhi: The Ministry of Health and Family Welfare, in collaboration with Ministry of Women and Child Development, organized a one-day National Workshop for Orientation of District Officials of Aspirational Districts on Health and Nutrition, here today. The workshop was inaugurated by Shri Ashwini Kumar Choubey and Smt Anupriya Patel, Ministers of State for Health and Family Welfare. At the function, the State Health Ministers unveiled the Operational Guidelines on Aspirational Districts for Health and Nutrition and launched the e-Mitra Mobile Application. Speaking at the event, Shri Choubey stated that most of the developmental gains for the country will come from aspirational districts. Therefore, to achieve equity and accelerated improvements in human development indicators, the Government has focused its energy on these districts, he said. Dr Vinod Paul, Member, NITI Ayog, Shri Rakesh Srivastava, Secretary, Ministry of Women and Child Development and Ms Preeti Sudan, Secretary (HFW) were also present at the inaugural function. In his address, ShriChoubeyfurther stated that this is a first of its kind initiative by identifying 117 districts under the ‘Aspirational Districts’ Programme with an aim to quickly and effectively transform them. He added that India has made great progress in the context of health indicators and have practically achieved MDG targets. “The decline in Maternal Mortality Ratio (MMR) has been the highest since the last several decades which has declined by 37 points from 167/ lakh live births in 2011-13 to 130/ lakh live births in 2014-16 within a span of just three years. This accounts for an impressive 22% reduction in MMR since 2013,” he said. Addressing the participants, SmtAnupriya Patel said that the Government is committed to achieving the goals of the National Health Policy 2017, and of the Sustainable Development Goals by 2030, “We have achieved impressive results in terms of accessibility and quality of services which resulted in reduced deaths of mothers, newborns and children, and improved health outcomes overall,” she said. SmtAnupriya Patel further said that in order to address the disparities, which are largely located in pockets within states, the Government has identified 117 Aspirational Districts. “It is expected that sustained and intensive efforts in programme implementation, monitoring and support will improve health and nutrition indicators and ensure that all people have equal access to high-quality health care,” she elaborated. The Hon’ble Prime Minister of India has coined the nomenclature of Aspirational Districts, thereby affirming a commitment to improvement in key indicators of these districts, so as to achieve the vision of a New India by 2022, she said. Dr V K Paul, Member, NITI Ayog, said that there is a profound responsibility as Aspirational Districts represent 20% of the geographical area and 20% of the population of the country. He stressed the need for making more interventions in these districts and said that we require people’s movement so that we can reach out to the people and deliver required services at the ground. Mrs Preeti Sudan highlighted the importance of convergence at all the levels. She laid stress on sanitation and said that it is non-negotiable for achieving the health outcomes. The e-Mitra (Mobile Integrated Toolkit RMNCH+A ) app has been designed to complement the Aspirational District Programme and offers a one-stop solution to access RMNCH+A related statistics from different sources through a combination of approaches. The workshop is attended by the senior officers from the Ministry of Health, MoWCD and NHSRC along with the representatives from 28 States, 117 Aspirational District Official and development partners like WHO, UNICEF, USAID, BMGF, TATA Trust and UNFPA etc., and civil society organizations.